Or, are you one of those last-minute Moms who will be hitting the malls today, searching for school supplies and the perfect first-day-of-school outfit? No matter how you're spending your day, meal planning and packing lunches/snacks will definitely be on your mind. Last week I posted a great crockpot recipe to help make things easier for you. 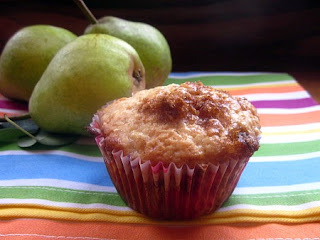 Today, I'm featuring an item that's perfect for a snack or quick breakfast. Mom, child or otherwise - this is a delicious treat! And yes, it's another recipe that has helped me use up the massive quantity of pears from my tree. Open this for your Labor Day party contribution.